Traces of Celtic Ireland- How did People Live Back Then? Celtic Ireland- How did People Live Back Then? In this article, I want to introduce you to Celtic Ireland, and specifically talk about how people lived back then. 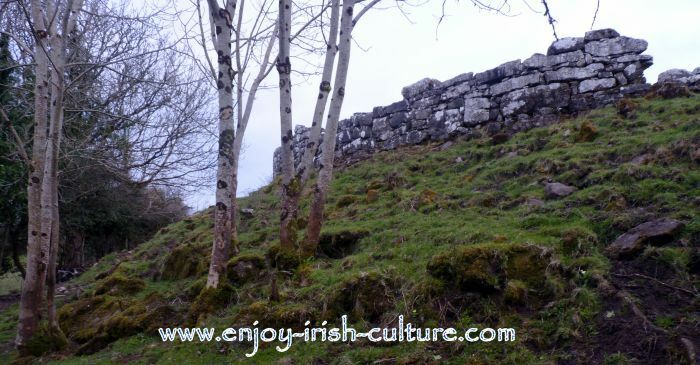 Come right in and take a walk with us around the stone fort at Clogher in County Sligo. How did Celtic Ireland Develop? The ancient Celts who arrived in Ireland during the iron age having been displaced from Europe, brought their own unique culture. But over time, judging from archaeological findings, their way of life blended with the already existing bronze age culture in Ireland to create a unique culture- Celtic Ireland. This was as true for the style of Celtic dwellings as it was for Celtic art, culture and their way of life. Now let's take a look at how people lived back then. 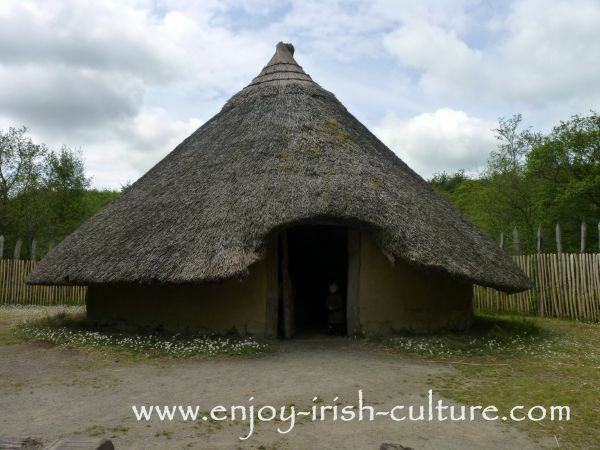 In this article, I will introduce you to stone forts, ring forts and crannogs, the typical residences of Celtic Ireland. Inside their circular walls, people would have lived in huts or tents. Why Were The Forts And Crannogs Of Celtic Ireland Defended? The architecture of the ancient Celts was all about defended structures. Yet the level of the defenses used- mostly wooden palisades and wooden gates, suggests that farmsteads expected little more than quick 'run and grab' raids. They might be at conflict with neighboring clans or overlords, and might raid each others cattle. That's why they built defenses and lived behind wooden palisades. But the ancient Celts still made merry, played games and sports and had a very intricate legal system, (Brehon Law) that regulated their pagan society. The people of Celtic Ireland were pastoral warrior herdsmen. A typical residence was the fort which served as a defended farmstead. You might call it a fortified ranch, seeing that Celtic agriculture was centered around the herding of cattle. Of these ring forts, believe it or not, 30,000 still dot the Irish landscape. You can see them in many places in the countryside once you start to look. Take note of circular patches of areas overgrown with shrubs and trees. Local farmers will often avoid ring forts, calling them ‘fairy forts’, believing you must not disturb the spirits living in them. The ring fort is a typical residence of Celtic Ireland which developed from what was initially just one individual circular hut. People quickly realized they needed defenses around their hut, hence the mostly circular bank or wall. There were two distinct types of ring forts. The type built depended on which building materials were available locally. 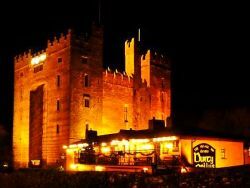 In the Irish language, both types of forts are known as ‘dun’, but they also have more specific names. 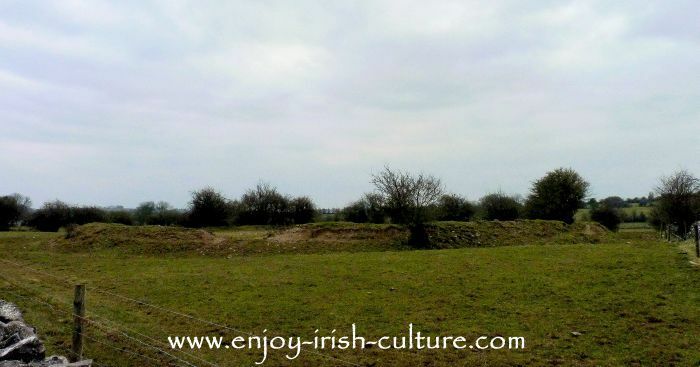 The first type, the ring fort or, in Irish ‘rath’ was made of a round earthen bank with a wooden palisade. 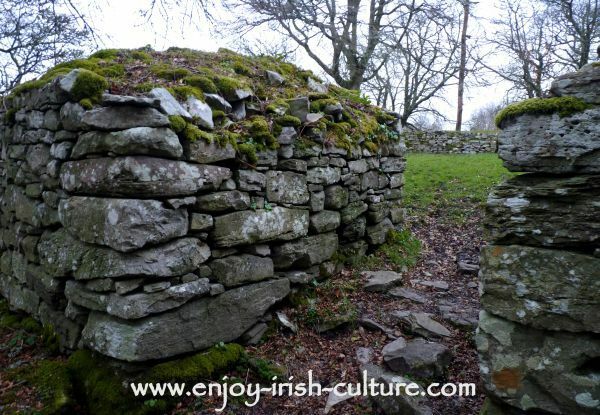 The other type, the stone fort- was a dry stone construction, known in Irish as a ‘Caiseal’. Stone forts, too, were circular in shape, although you will see some which are almost square in shape. These were built later- in early medieval times. Traces of Celtic Ireland- The entrance to Clogher stone fort, County Sligo, Ireland. Within the enclosure of a fort you would find one or more buildings made of materials available locally, such as natural stone, or wattle and daub. These buildings were the residences of the family, grain stores and associated farm buildings. Forts also provided some space for gardening for growing herbs or vegetables, all within the protection offered by the circular walls. Cashelore stone fort (below) in County Leitrim is located a short 15 minute drive from Sligo town and lends itself to a great excursion on a dry afternoon for the beautiful views of the Ox Mountains alone. Celtic Ireland- Cashelore stone fort, County Leitrim, Ireland. The photo below shows Rathbeg ring fort at Rathcroghan, seen from the road. Start looking out for these earthen mounds in the countryside and you will be surprised just how many you will be able to identify. This rather large one used to be the residence of ancient Celtic nobility. Ring forts consist of earthen banks. at the top of the bank there were wooden palisade fences to keep out unwanted visitors. To this day, ring forts are an integral part of the Irish landscape. You can find their circular earthen banks in virtually any rural area. Often they are overgrown by trees, sometimes they have been integrated into farms. But many farmers are superstitious and would rather not touch them. Ring forts came in different sizes. Most ring forts were small and are considered to have been single farmsteads, typically defended by one bank or wall only. Bigger ones which had a diameter as great as 200 feet and were defended by multiple banks were probably the seat of kings and nobility. Some ring forts were reserved for rituals and ceremonies. There were no towns here until the arrival of the Vikings in Ireland hence many of the large ring forts served similar functions to towns. Forts could be used as meeting places or as places to hold markets, for example during annual fairs called ‘Oenach’. Large centres such as Tara or Rathcroghan were used for big annual fairs. Celtic Ireland- reconstructed inside a ring fort at Craggaunowen heritage center. Our borrowed ring fort residence for the day at Craggaunowen outdoor heritage museum in County Clare. Many stone and ring forts contained a feature known as a souterrain. A souterrain was an underground passage which was used for storage, but also provided refuge and sometimes a secret way out of the fort to be used when under attack. A souterrain was awkward to enter for an attacker, but it was easily defended by the residents. 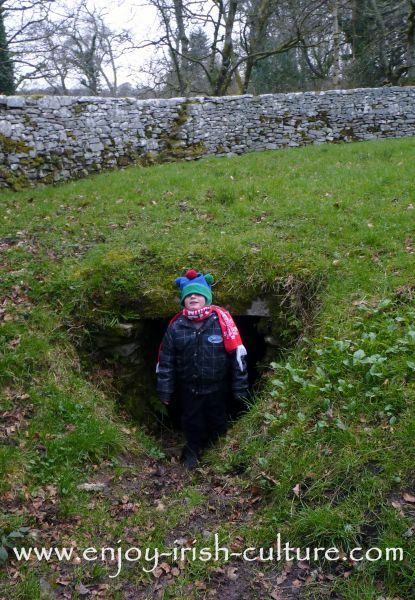 See our brave six year old emerging after exploring the first few feet of the souterrain at Clogher stone fort in County Sligo on the photo below. 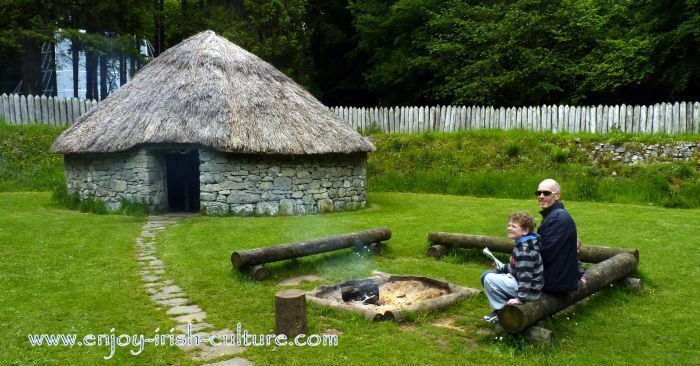 The photo below shows a reconstructed crannog at the Irish heritage center of Craggaunowen. As you can guess from the picture, Crannogs are dwelling sites on lakes. Like stone forts and ring forts, they were usually circular in shape. People created artificial islands by mounting up huge amounts of rock , soil or fallen trees. Imagine the work involved, with an average size crannog measuring some 25 meters in diameter. Once a platform was created, they erected wattle and daub thatched dwellings, surrounded defenses which typically were wooden palisades. The water, too, helped of course, making access difficult for any potential attackers. During the iron age, crannogs appeared in Ireland in large numbers. Find out more fascinating facts about how people lived in ancient Ireland. Find out about the marks ancient Ireland left in the landscape at Lough Gur, County Limerick. Hope you liked our article on Celtic Ireland. If you did, why not tell your friends so that they, too, can find us and enjoy the content we provide? Just use the social options top left and at the bottom! Many thanks for your support and warmest regards from Susanna and Colm!